Team Canada defeated Japan 6-5 after ten dramatic innings at Mokdong stadium, Seoul, in the first round of the XXV IBAF 18U Baseball World Championship. Japan took the lead with two runs in the first. Leadoff Tomoya Mori had a single, advanced to third on a bunt by Iyota and Tamura’s single, scoring on Otani’s sacrifice fly. Tamura went to second on a wild pitch by Canadian starter and Blue Jays draftee Ryan Kellogg. Fumiya Hojo sent him home to score with a single to left field. Japanese high school star Shohei Otani’s pitches often touched 93 mph, still, the Canadian lineup was able to come back between the third and the fourth inning. Jacob Robson reached first base on a fielder’s choice by Hojo and scored the first run after a wild pitch and a single to centerfield by Kyle Hann. In the fourth, Otani hit Siddall with his fifth pitch and walked Pinero. A single by Spiwak tied the game and a single by Hodges sent team Canada on top 3-2. It would also send Japanese starter (who also collected 1 hit and 2 RBIs at the plate) to left field and reliever Takahito Otsuka on the mound. Team Nippon took advantage of a walk, a no-out fielder’s choice and an error by the Canadian defense and to score three times in the seventh out of two hits, forcing the replacement of Kellogg (6.2 IP, 2 ER, 3 BB, 3 SO). Travis Seabrooke closed out the inning, but left the mound for Cal Quantrill, who took care of the eighth. Otsuka, who had been perfect for 4 innings and two thirds, gave up a single to Pinero and a two-run homerun to Jesse Hodges that tied the game once more in the ninth, leading to the first IBAF Extra Inning Rule in the tournament. 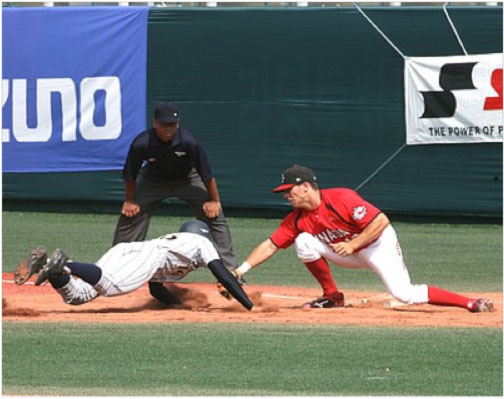 Japan’s manager Ogura chose second baseman Iyota as his first batter, so Otsuka was placed on second and Mori on first. A passed ball turned into a first out for Canadian catcher Chris Shaw, who perfectly threw to third baseman Hodges. Hodges also performed a diving catch of Iyota’s hard hit ball and made the second out and a great play by first baseman Brett Siddall on Tamura’s grounder gave the Japanese offense an end with no runs scored. With Hodges on second and Robson on first, Hann perfectly put the ball on the ground for the sacrifice hit who pushed the runners to the next base. New Japanese pitcher Yu Kambara intentionally walked Desouza, then struck out Morgan, but the fourth pitch to Siddall landed in the dirt, impossible to catch for Mori, and gave Hodges the opportunity to score the final run of the game.